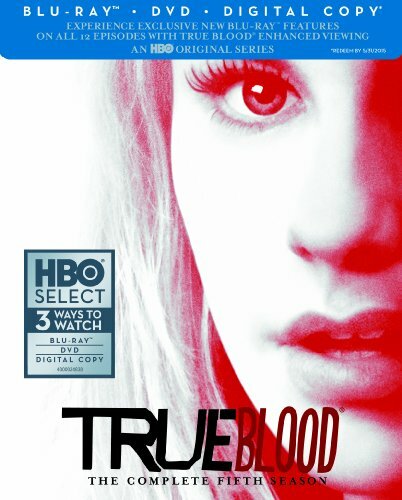 Order ‘True Blood: The Complete Fifth Season (Blu-ray/DVD Combo + Digital Copy),’ available from Amazon.com by clicking on the DVD cover above! Could there be a better time to interview actress Lauren Bowles? In a career that’s been steadily on the upswing, she joined HBO’s bloody hot drama “True Blood” this season as the newest waitress at Merlotte’s. And the show’s three topline stars, Anna Paquin, Alexander Skarsgard and Stephen Moyer, appear naked on the cover of Rolling Stone this week, dripping in blood—fake blood, I assume, but it got the idea across. Besides True Blood, Lauren will appear in February in the next Farrelly Brothers movie, Hall Pass, with Owen Wilson and Christina Applegate. Today, the New York Times did a major story about New York fashion being overtaken by the influence of “Seinfeld” TV character Elaines Benes. What does that have to do with Lauren Bowles? Elaine was played by her sister, Julia Louis-Dreyfus. But she’s also married to the business: “Mad Men” fans will recognize her husband Patrick Fischler as foul-mouthed comedian Jimmy Barrett, whose wife Don Draper memorably shtupped. Patrick also did extended stints on “Lost” and “Southland” before landing a role in the Steve Carrell comedy, Dinner for Schmucks. How about that? I worked in “shtupped” and “schmucks” into a single paragraph! And on top of everything else, she’s a new mom, so let’s try to keep it down on the set and not wake the baby.